"What is a poker run?" asks Newbie Neil on the Ninja 250. I explain to Neil as best I can in the short time we have before we have to get to our first checkpoint. "That’s not right!" chimes in Varicose Vern from his BSA Victor. "The only real poker run is played with real playing cards," he concludes. 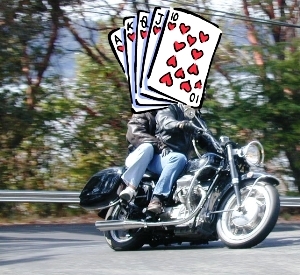 There are many renditions of a poker run, but for those who haven’t a clue, here’s some poker run basics. For starters, think of it as a good excuse to ride your motorcycle. In the classic game of poker, each player is dealt five cards. The person with the best hand wins. Couple this with a nice motorcycle ride and you’ve got yourself a genuine poker run. The event begins when you check in and receive a score sheet and route map. Typically there are five checkpoints along the route and you will draw a card at each one. You draw a card, it will then be noted on your score sheet and you will ride on to the next checkpoint. And like a game of poker, the person with the best hand at the end will be deemed the winner. Then the arguments may ensue that a full house is a higher score than a royal flush and on and on. To simplify that issue, some people use poker chips marked with numbers. The number of the chip drawn is marked on the score sheet and it’s much simpler to determine the winner at the end of the day. Who participates in poker runs? Riders of all types of bikes and riding styles ranging from cruisers to vintage iron, sportbikes to Gold Wing tourers; the poker run transcends all formats, makes, models and riding styles. You’ll find a poker run in progress nearly any weekend in any given state being run on pavement or dirt, or even between the two as a dualsport event. Registration fees for poker runs are typically used to raise money for charities, clubs and good causes such as paying for a downed rider's medical bills who was underinsured. Certain clubs like the Vintage Motorcycle Enthusiasts rely on their annual poker run as a way to raise part of the money for the club's annual operating budget. But is it gambling? A straight-out game of poker is gambling because it is purely a game of chance. To keep the local gambling commission at bay, many event promoters insert a game of skill into the route that helps determine the riders' final score. The most common is a dart toss which can get as many as 50 points added to your score. If the run uses playing cards, then you'll throw a dart at a large board covered in playing cards. Others games of skill can be played as well. One club had a checkpoint point where riders had to ride 30 feet in 30 seconds, one point per second in the 30 second period. They would lose points if they went too fast and reached the end too soon, and stopped getting points if a foot touched the ground during the task. Besides having a chance to win some prizes, another bonus to a poker run is that you may ride down a few roads you’ve never been on and enjoy some new scenery along the way. While some poker runs are held in the city, others may take you along back country roads past houses, farms and fields. Others may whisk you past tall mountains, swift rivers, around islands or to historical monuments. Putting on a poker run means the event promoter must arrange for volunteers to run the various checkpoints along the way. If the route is a loop, he or she may be able to reduce the number of volunteers needed by placing the same volunteers from checkpoint one on checkpoint four which will open later in the day. If the same can be done with the volunteers at checkpoint two by moving them over to checkpoint five later, then a minimum of three volunteers are needed. But there’s another way to circumvent all that. The rolling poker run is a great way to handle a small group event. In this format, one person has the cards/chips and rides with the group from checkpoint to checkpoint doing the draw/score task along the way while the others all play. Adventure, fun and a chance to ride with old friends and make new ones are all part of the poker run experience. If you haven’t participated yet, check our calendar and ride one soon.